Why you need to follow the Korean face routine. Life can take its toll on our face. Maybe you are in your 20’s and still get acne and pimples that can make you feel down and less confident. You would think that it would all be over when the teenage years ended, but for many women it does not. Or perhaps you are starting to see wrinkles and the beginning of sagging skin. For most women that day that your first notice that your skin has started to sag is a wake up call and a bit of a shock It doesn’t matter what type of life you lead any one can suffer with acne and many women start to see wrinkles earlier than they should. To keep your skin in great condition you need to follow the Korean face routine. Yes there are many steps in the face routine, BUT many take less than a minute to do and the results PAY OFF. Beauty lovers, who have chosen to try the face routine, love it! It just works. The Korean face routine is not for someone who just wants to wash their face with water and slap a cream on. If that’s you, it will be too much work for you. But if you want to improve your skin and then maintain it, AND your willing to put in time in the morning and evening, then you need to seriously consider getting on board the K Beauty train. 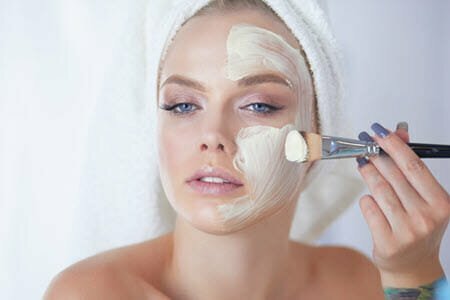 At first the face routine will seem a little long. Once you know what the steps are and you customize the products to your skin type and skin concern, it is quite fast to complete the steps. The Korean face routine can be adjusted too. Some nights you may only do 5 steps and another night you may do 10. But if you stick to the basic face routine you will improve and maintain your skin. Here’s each step, what it does and the products involved. First you cleanse with an oil based product. Next you cleanse with a foam or water based product. An oil cleanse is loved by Korean women as they believe that oil attracts oil. So an oil based cleanser will remove the oil from your skin, as well as makeup and sunscreen. The foam/water based cleanser will provide a deeper clean. It removes all traces of the oil cleanser and leaves your skin looking and feeling beauty salon clean. Koreans are big on exfoliation. Removing the top layer of dead skin helps to make skin look brighter, feels smoother and is a good anti-aging habit to get into. Exfoliate 2 – 3 times per week. Too much exfoliating can aggravate skin, make it sore and red. Stay safe side and only exfoliate 2-3 times per week. Korean toners are gentle on the skin. Most Korean products contain plant extracts and natural ingredients. Using a K beauty toner twice a day will not harm your skin. Korean toners hydrate the skin and help it to absorb the next products. They will not strip your skin. Essences are not commonly used in a Western or European face routine, but they are in Korea. They really are fantastic. An essence is not a toner or a serum, but something in between. It is applied in step 4 and helps cell to turn over and renew as well as brighten the skin. If you want a essence for anti-aging or acne, there is sure to be one for you. There are many essences that available to treat your specific skin issue. An essence is quite watery so be careful when applying it to your face as it could run through fingers. Serums help to treat your skin concerns If you’re trying to clear your acne, reduce the appearance of wrinkles or treat redness and dryness, a serum can help you. Serums are full of active ingredients and are another layer that help get your skin into great shape. The Korean face routine includes weekly sheet masks. Sheet masks contain highly moisturising ingredients. Sheet masks are literally a cloth mask that is drenched in product. They are shaped like a face and have eye and mouth holes so you can see and breathe. They are applied and then left on for 15 – 20 minutes. They are really wonderful for acne and other skin types and provide another layer of moisture and treatment. Pat any excess product into your face, neck, and chest are and if you are over 40, the back of your hands. The skin around our eyes is delicate and fine. Wrinkles, dark circles and puffiness all make us look older and tired. Korean women start to use an eye cream at a young age. Snail mucin (yes from snails) is a favourite eye cream ingredient as it is super hydrating and renewing. When you apply your eye cream, use your ring finger, next to your little finger, and gently pat and press the cream onto your skin. Do not rub and pull at your skin. Korean moisturizers are available in a few types. They can be a cream, facial oil or gel. The facial oils are non-comedogenic, this means they will not clog your pores. If you are concerned about anti-aging and wrinkles and especially sagging skin, we suggest using a facial oil. When you apply face cream, oil or gel, use upward strokes to stimulate the skin and help circulation. If you live in the West getting out doors in the sun is common. Whether it’s a day at the beach, playing sport or having friends over in the backyard, none of us can escape the sun. We all need to spend some time in the sun as our bodies need Vitamin D, so it is necessary to make sure we protect our skin from premature aging. Make sure you use sunscreen every day. The beauty of the Korean face routine is that it helps to treat any skin conditions that you have…and then you maintain your new beautiful skin. The K Beauty face routine will help you to keep your skin super moisturized. Dehydrated skin is dry and looks old. If you have really dry skin, we suggest that you also use a sleeping mask. This is a cream that is very hydrating and works overnight. Adding another layer of moisture into your night time routine will give your skin a serious dose of maximum hydration that it needs to look its best. There are a many sleeping masks available. They are great quality and not expensive. Sleeping mask cream is thicker and heavier than a day cream and suitable for anyone concerned with aging. It can be very tempting to go to bed without removing your makeup, especially if you are tired. If you wear make up every day, you need to remove it at night. If you leave it on you are blocking your pores and not helping your skin. Double cleanse at night to get rid of all makeup, dirt and grime from the day. The Korean face routine is the way to help your skin become picture perfect. Follow it for at least 30 days and you will see and feel a big difference. Korean Skin – 10 Minutes A Day To Your BEST EVER Skin!